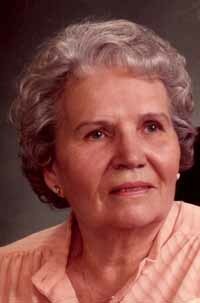 Wilma "Billie" Frances Horne Buhler passed away on Wednesday, Feb. 23, 2011, in Boise, Idaho, at St. Alphonsus hospital. She was born in Hailey on March 20, 1914, and lived in the Wood River Valley for almost 97 wonderful years. Woodrow Wilson was president of the United States when she was born. Her father, Robert Ray Horne, also born in Hailey, married Phelena Cantine Spencer from Los Angeles. They had five children and first lived on a farm up Quigley Creek. Water for the house had to be taken from the creek. Mother described it as a "very humble home." The family moved to Hailey and lived close to the grade school that all of the children and their father graduated from. Two moves later, they moved into the home that became known as the Ezra Pound house. Her mother taught her how to sew, and that skill was enhanced in her home economics studies, a bonus in her life. She remembered "not having too much money growing up, but we were always well dressed, and happy, even with underpants made from flower sacks." She enjoyed playing basketball and tennis in high school. Her father would take the basketball team to Gannet for their games in a sleigh with a wood stove to keep them warm. It was an all-day and into-the-night trip, but it was fun. She graduated from Hailey High School in 1932. She worked for the telephone company the summer after high school and enjoyed dancing for entertainment. She invited Harold Buhler to a dinner dance that the young ladies' mothers put on, and he accepted. They started to attend the weekly dances, and their courtship lasted about one year before they decided to marry. Dancing continued to be important to them, and included waltzes and square dancing with couples who would become the best of lifelong friends. They were married in 1934 and lived for two years on the Buhler ranch before moving to a small house in Bellevue when Harold took a job with the Wood River Water Board. In 1941, they moved to their first purchased home in Hailey with their three sons. They purchased a dairy farm where they milked the cows, bottled the milk and then delivered the milk to homes in Hailey. The farm was sold but they kept the delivery side of the business. They delivered to homes and businesses in Hailey and Ketchum with products purchased from Young's Dairy in Twin Falls, Idaho. An opportunity then became available to operate the Bellevue Ranch in partnership with Harold's parents. Billie had taken a leave from the phone company until the boys were older. When Mountain Bell no longer needed operators to connect and manually ring the phone, she retired and then took a job with the Blaine County Sheriff's Office as a deputy. She retired again in 1962 and became very serious about her quilting. To Harold and Billie, their church and their calling were always a very important part of their activities as a family providing them with a wonderful life and strength for their community activities as well. Between the farm and her work outside the home they did not take many vacations or leave the valley for very long, but after retirement they visited the Holy Land, Europe and Western Samoa. Billie was preceded in death by her husband, Harold Burdette Buhler; her oldest son, Gerald Horne Buhler; her sisters, Roberta McKercher, Barbara Irwin and Laura (Deni) Newman; and her brother, Robert Keith Horne. To her two remaining sons, Harold Keith Buhler and William Spencer Buhler, she leaves a legacy of love and understanding. She thanks the Hinckley, the Fowls and the Miller families for the daughters she always wanted but had to wait a few years for. In lieu of flowers, Keith and Bil along with 15 grandchildren, 47 great-grandchildren and seven great-great-grandchildren, ask that donations be made to the Senior Connection of Blaine County, Box 28, Hailey, ID 83333. The entire family would like to thank the Idaho Home Health and Hospice Center, especially Dr. Clinger, Lori, Stephanie, Melody and Jennifer, for their expertise in taking such good care of a special lady. Funeral services were held Tuesday, March 1, at the Hailey LDS Chapel. Interment followed in the Hailey Cemetery. Friends are invited to share memories and condolences at www.woodriverchapel.com.